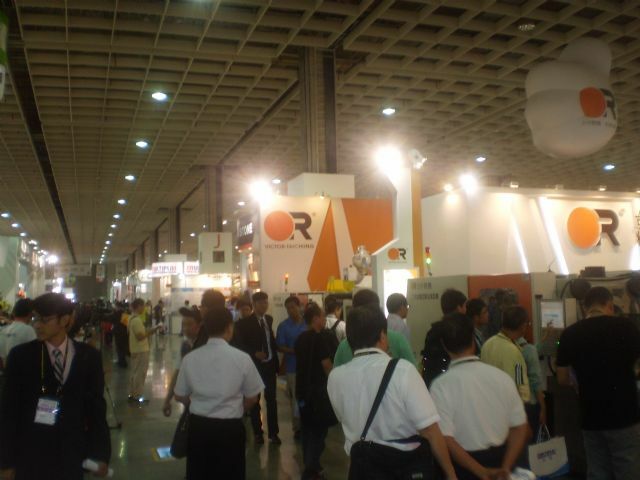 Renowned as Asia's largest, most important trade fair for plastics and rubber industries, the Taipei International Plastics & Rubber Industry Show (Taipei Plas) continued to live up to its reputation this year by attracting a record number of exhibitors who showed state-of-the-art technologies and machinery that meet the latest market trends. 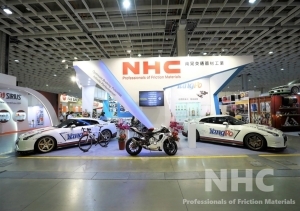 Taipei Plas 2014, held September 26-30 in the TWTC Nangan Exhibition Hall in Taipei, hosted 530 exhibitors occupying 2,670 booths, of which 337 were domestic along with 24 from China and 116 from foreign countries, including Japan, England, Hong Kong, Germany, Thailand, Austria, Mexico, Singapore and Korea, according to the final report by Taiwan External Trade Development Council (TAITRA), a semi-official export promoter, who organizes the exhibition in cooperation with Taiwan Association of Machinery Industry (TAMI) biennially. People familiar with the industry and operators recognized Taiwan's top suppliers at the show, including Nan Ya Plastics, Kung Hsing Plastic Machinery, Fu Chun Shin Machinery Manufacture, Haurong Plastic Machinery, Multiplas Enginery, Jon Wai Machinery Works, Victor Taichung Machinery Works, Avita Machinery, Diin Kuen Plastics Machinery, New Power Team Technology, Jenn Chong Plastics Machinery, Lien Fa Injection Machinery, Ye I Machinery Factory, Hyplas Machinery, Chuan Lih Fa Machinery Works, Queen's Machinery, and many others. 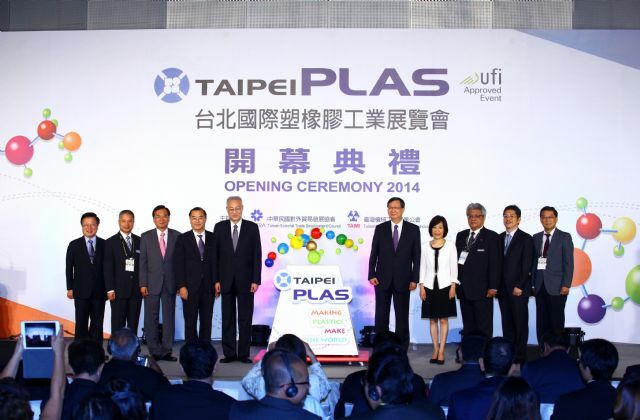 Taipei Plas 2014 scores record highs in exhibitor and visitor numbers. For decades the plastic machinery has been the second-largest of Taiwan's machinery exports, only next to machine tools, enjoying sound reputation among professional users worldwide for high performance and excellent price-to-quality ratios. According to statistics compiled by TAMI, Taiwan's plastic and rubber machinery exported US$1.265 billion of products 2013, shrinking 6.2% year-on-year (YoY), mainly due to global economic slowdown, geopolitical tensions in the Mid-East, which undermined willingness among international enterprises to invest in fixed assets. However with some easing of such sectarian conflicts and the U.S. seeing steady economic recovery as shown in improving employment, Taiwanese suppliers are gradually shaking off doldrums. TAMI's report shows the sector's exports amounted to US$596.65 million during the first half (H1) of 2014, slightly down 1.8% YoY, with plastic injection molding machines, extrusion machines and blow molding machines together making up the majority of the total. 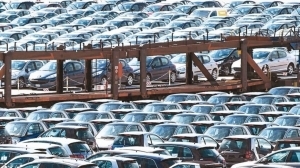 Exports to China and Hong Kong made up 27.8% of the total to reach US$166.96 million, up 50.9% YoY, during H1, with those to Vietnam and Indonesia totaling US$49.69 million and US$45.99 million, respectively, to command an 8.3% and 7.7% share. Meanwhile, exports to Japan, the U.S., the Philippines and Russia all showed encouraging YoY growths of 27.7%, 24.8%, 53.1% and 7.3%, respectively, while those to Thailand, India, Malaysia and Turkey, however, were down 28.3%, 36.1%, 19.8% and 15.7%. 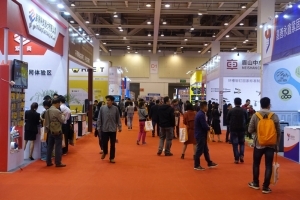 With ever more new electronic devices as smartphones continually being launched to trigger strong demand among manufacturers for production equipment, Taiwan's plastic and rubber machinery exports are expected by operators to gain more steam in H2 than in H1, with such optimism contributing to the success of Taipei Plas 2014. (Starting second from left) David Wu, TAMI’s chairman of Plastics & Rubber Machinery Committee; H.T. Hsu, TAMI’s chairman; San Gee, TAITRA’s vice chairman; D.Y. Wu, Taiwan’s Vice President; and S.C. Cho, vice minister of Ministry of Economic Affairs at TaipeiPlas 2014’s opening ceremony. Adding to the buzz generated by the big turnout at the opening ceremony, including scores of local and foreign media, was Dr. San Gee, TAITRA's vice chairman, who noted that since its inauguration in 1987, Taipei Plas has been held biennially to experience continuous growth and resounding success, mostly thanks to support from Taiwan's ever-growing plastic and rubber machinery sector, with the 2014 edition's record exhibitor size and scale underscoring the show's success. 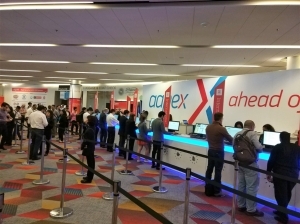 A record 530 exhibitors in 2,670 booths pushed up the exhibitor number by 12% from the last edition, and by 16% the number of booths. While a large number of foreign exhibitors from 14 countries took part in the show, delegates from China's CCPIT (China Council for Promotion of International Trade) came the third time to set up the Cross-Strait Plastics & Rubber Pavilion. 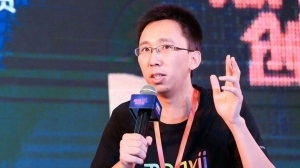 With more than 2,000 foreign buyers, TAITRA's vice chairman added that on-site and follow-up business opportunities may exceed US$200 million. H.T. Hsu, TAMI's chairman, noted that following some 50 years of development, Taiwan's plastics machinery sector today has than 400 manufacturers, who are generally known among international buyers for offering excellent products and reasonable prices, and Taipei Plas 2014 provided the best platform to international participants to communicate face-to-face with global buyers. David Wu, chairman of Plastics & Rubber Machinery Committee, TAMI, confirmed that contract manufacturers for the iPhone 6 adopt fully-Taiwan-made plastic injection molding machines, with Samsung having also ordered such equipment. 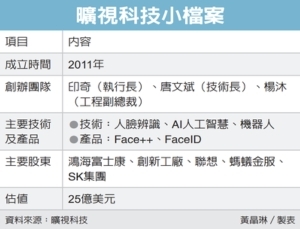 Benefiting from the launch of iPhone 6 and other new electronic devices, Taiwan's overall plastic machinery exports grew significantly July-August, and are very likely to keep increasing in the remainder of this year. S.C. Cho, Taiwan's Vice Economic Minister, stressed that Taipei Plas is one of Taiwan's most important business platforms that link local high-quality suppliers with global buyers, as well as the most influential event for Asia's plastic machinery industry. Taiwan's plastic machinery sector's annual output value exceeds NT$50 billion (US$1.67 billion), with exports amounting to US$1.2 billion last year. 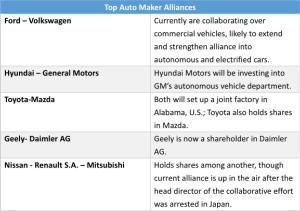 Despite globalization and price competition from rivals in advanced and emerging countries, Taiwanese suppliers compete well on manufacturing flexibility, product differentiation, custom production and totally integrated automation. 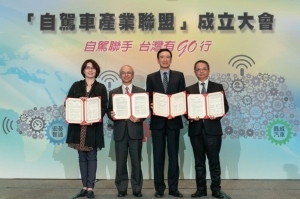 To help Taiwanese suppliers stay competitive globally, the Taiwanese government will step up forging free-trade agreements to enable Taiwan to play a part in regional economic integration worldwide. At the opening ceremony, Taiwan's vice president, Wu Den-Yih, confirmed that the government will complete the construction of the TWTC Nangang Exhibition Hall 2 by the end of 2016 to accommodate even more participants in the show. Although the new exhibition facility may fail to open before Taipei Plas 2016, the 2018 event will for sure take place in a bigger venue and remain the largest trade fair of plastic and rubber machinery in Asia. Some 18,643 visitors, 17% more than the last edition, came to the show and were often treated to live demonstrations, and they also saw product categories including Plastic & Rubber Processing Machinery, Injection Molding Machinery, Blow Molding Machinery, Extruders, Printing Machinery, Auxiliary Equipment, Molds & Dies, Parts & Accessories, Raw Materials and Semi-Finished & Finished Products; and encompassed vertical hybrid injection molding machines, automatic plastic injection molding, server energy saving injectors, microcellular injection molding machines, in-mold automatic labeling machines, gearboxes, multilayer co-extrusion film blowers, automatic PET machines, vacuum and heat pressure molding machines, automatic waste material recycling lines, tire recycling equipment, robotic arms, computerized thermal controlled membrane thickness molding, precision molding, chemicals, plastic profiles, and other peripherals and components. 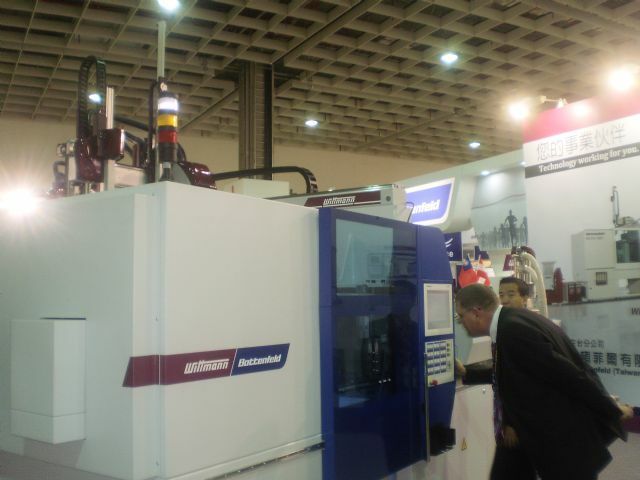 Some of the latest technologies at the event were presented by Wittmann Battenfeld (Taiwan) Co., Ltd. The Austria-based firm laid out the micro injection molding machine, MicroPower 15/10; the fully electric injection molding machine, EcoPower 110-350 B6P; double-cylinder direct clamping injection molding machine, HM160/525; the gravimetric blender, G14; the five-axis double-arm robot, W818; and the mold thermo- controller, Tempro Plus D, all of which are designed to provide buyers energy-efficient, automated manufacturing. 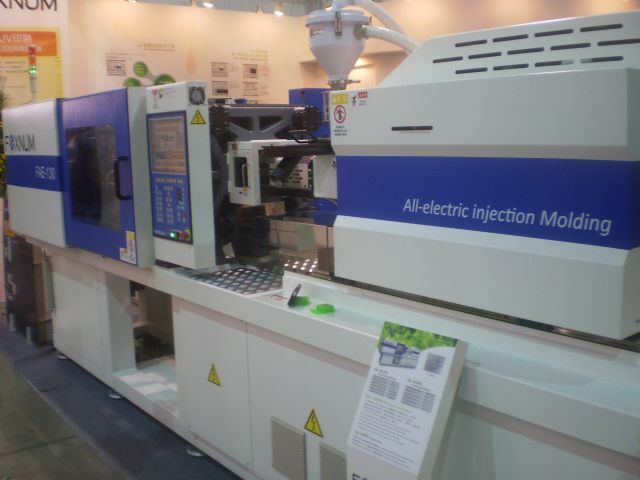 Wittmann Bottenfeld’s EcoPower 110/350 B6P all-electric plastic injection molding machine. Riding the wave of automation, Hiwin Technologies Corp., a leading Taiwanese listed maker of precision parts and components and robotic arms, showcased ball screws, linear guideways, positioning guideways, precision bearings, AC servo motors and drives, linear actuators, linear motors, and various industrial robots, with its articulated robotic arm highlighted with a rugged profile, high precision and impressive dexterity, hence attracting constant influx of interested buyers. Another Taiwanese, globally known firm, Moldex3D presented its CAM (computer aided manufacturing), CAD (computer aided designing) and CAE (computer aided engineering) software, including the eDesignSYNC for PTC® Creo® which helps users synchronize design changes and validate product designs with Moldex3D's simulations with minimum effort, featuring easy-to-use interface that streamlines workflow and reduce training time, and supports the advanced symmetric function to enhance analytical accuracy and reduce calculation time. 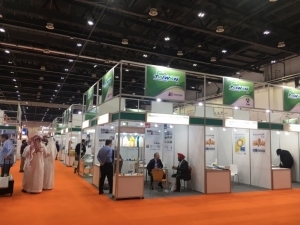 Among the exhibitors from Japan, MEC Company Ltd., a chemicals and related materials producer, promoted its AMMLPHA metal-resin bonding technology, which creates rough metal surface to optimize bonding of resins to metals without adhesive, ensuring high bonding strength and high airtightness at the bonding interface. The technology is applicable to wide-ranging metal-resin combinations. 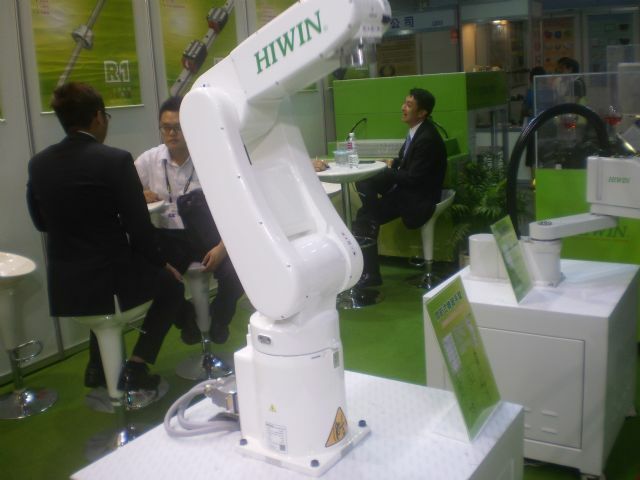 Hiwin’s articulated robotic arm has rugged profile, compact exterior and great dexterity. 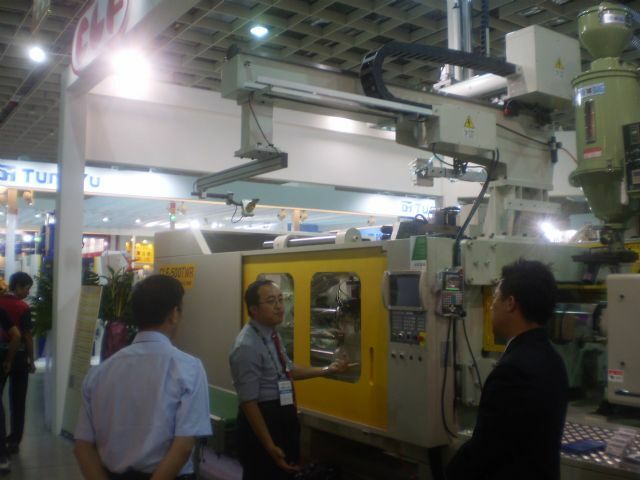 Also a Japanese exhibitor, Sodick Co., Ltd., demonstrated its vertical injection molding machine and electric hybrid injection molding machine. The machines employ the so-called V-Line System whose feeding screw along with the cylinder and motor rotate to force materials into the mold to prevent backflow during injection molding to ensure better stability and easier maintenance than in-line system. Further, those machines have an improved electric hybrid mold clamping mechanism for high precision mold-opening, as well as a high-efficiency power control system to save 23.5% power with 7% less noise. A Taiwanese supplier of injection molding machines, Chuan Lih Fa Machinery Works Co., Ltd., brought its TWR and TXR series multi-color, multi-resin plastic injection molding machines to the event, receiving high accolade for outstanding performance achieved through cutting-edge technology. The TXR series, for instance, are co-injection, multi-color models for sandwich injection molding, marble pattern injection molding and striped product injection molding, with a Japan-imported color TFT 14-inch LCD display, PID (proportional-integral-derivative) thermo-control, and screw protection and thermocouple breakage detection functions, as well as four-step mold opening and closing strokes precisely controlled by microcomputers. 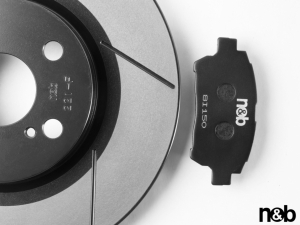 The series is also linkable to a remote computer through Ethernet for data transmission, storage and analysis to help enhance production management and quality control. Chuan Lih Fa unveils its TWR and TXR series injection molding machines. This year's event also saw obvious efforts by exhibitors to address energy efficiency via all-electric and servo motor-powered machines. Foxnum Technology Co., Ltd., an injection molding machine and servo drive, servo motor technology developer affiliated with Hon Hai Group, world's largest EMS (electronics manufacturing service) provider by size, brought its FAE series all-electric injection molding machine, which adopts toggle mechanism with enlarged tie-bars and toggle size to prolong lifespan and keep mold positioning accuracy to sub-0.01mm, and the innovative injection molding design to achieve injection speed of 300mm per second. Also, the firm's self-developed servo-driven system composed of a high-efficiency servo motor to attain easy maintenance, synchronized multi-axis motion and triple the torque of ordinary models. Foxnum’s FAE-130 all-electric injection molding machine employs advanced control systems and high-performance components all developed independently. Meanwhile, Victor Taichung Machinery Works Co., Ltd. displayed its Vαseries all-electric injection molding machines, which are highlighted with high-performance servo motors coupled with absolute encoders and high-precision load cells to achieve outstanding stability, and low-inertia motors along with built-in ABS encoders, high-quality ball screws and PC-based controllers for 10-plus times the precision of conventional hydraulic models. The machines are also noted for oil-free maintenance and clean output. ChumPower Machinery Corp., a PET stretch blow molding machine supplier founded in 1993, showcased its fully-electric stretch blow molding machine, with 30-35% more output than competing models, as well as 10% lower power consumption and 20-25% air consumption. The unit turns out 9,600 550cc, 18-gram PET bottles an hour, or 13,000 pieces with optional devices. Taiwan-based FSC Group, a supplier of injection molding machines, captured intense attention with its full lineup of injection molding machines, including the close-loop hybrid models, the all-electric models, high-tech intelligent models, servo power-saving models, two platen hydra-mech models, thermosetting models, sandwich models, etc. 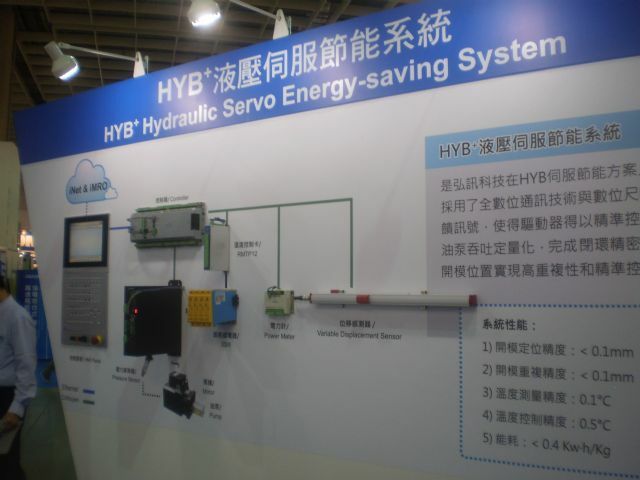 Development of servo systems were also a hit, and the HYB+ Hydraulic Servo Energy-saving System by Techmation Co., Ltd., a Taiwanese developer of automatic control systems for plastic machinery, provided a striking example. The system combines advantages of hydraulic and servo-drive systems to save 40% to 70% more energy than traditional hydraulic systems. Moreover, it also features fast response, high precision control, excellent repeatability, low overflow unloading and smooth injection molding action control. The HYB+ Hydraulic Servo Energy-saving System by Techmation. While the heydays of Taiwan's blown film sector have long gone, operators are still working hard on improving machines and technologies to satisfy increasingly fussy customers. 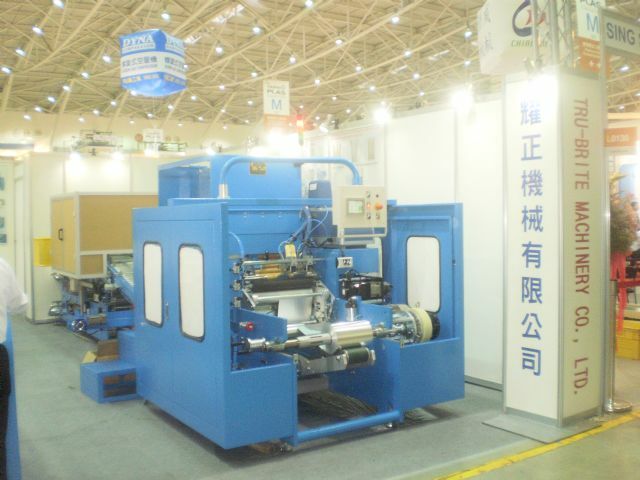 Kung Hsing Plastic Machinery Co., Ltd., displayed its multi-layer co-extrusion high speed blown film line, KS-CFLL65+75T, which has a die 250mm in diameter, continuous type gravimetric dosing unit from Germany, auto thickness profile control system, computer-controlled IBC (internal bubble cooling) system developed in the U.S., 360-degree thickness profile gauge with an oscillating rail, horizontal oscillating take-up unit, and back-to-back automatic surface type winding unit, to achieve high productivity of 450kg/hr, stable output and excellent power management. 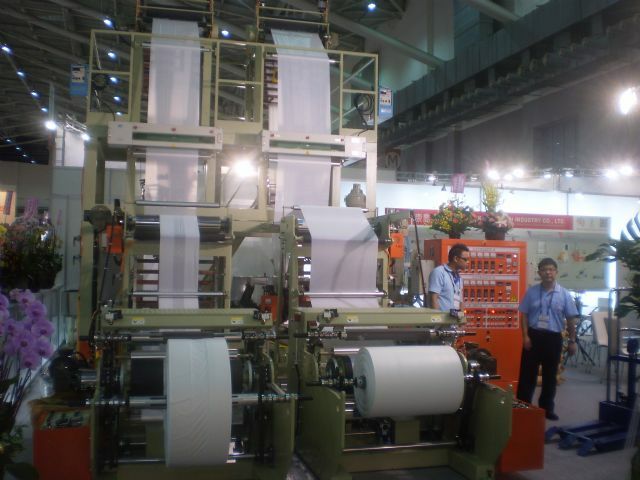 Kung Hsing receives ample inquiries for its multi-layer co-extrusion high speed blown film line. 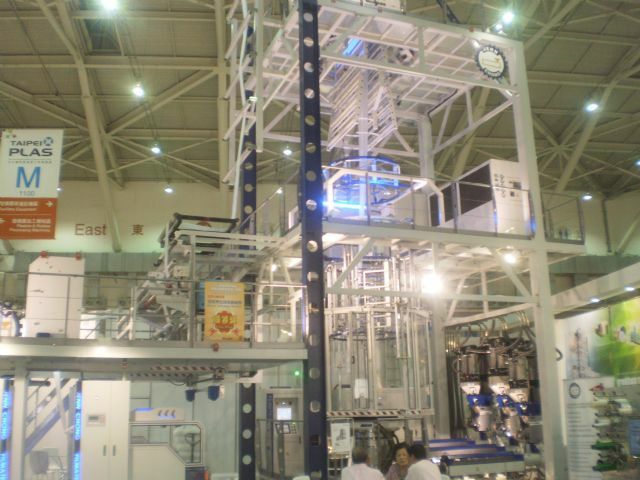 Another Taiwanese supplier of this kind, Jenn Chong Plastics Machinery Works Co., Ltd. showcased its JC-3CX series 3-layer co-extrusion blown film line, with the extruders beefed-up with an improved transmission system composed of four motor gears. Such transmission system has lots of advantages over conventional ones composed of belts, gearboxes and motors, such as less noise, 30-40% lower power consumption, and, particularly, more stable operation since the system keeps rolling even if one of the four gear motors malfunctions. The extruders set Jenn Chong apart from its Taiwanese peers, given that few use gear motors in transmission systems, partly because they are costly, albeit the mechanism is a growing trend. Jenn Chong’s brand new JC-3CX-1700RC High Performance Multi-layer Co-extrusion Blown Film Machine wins award for extrusion units beefed-up with gear motors. Kang Chyau Industry Co., Ltd., one of Taiwan's largest injection molding machine suppliers by shipment, launched its twin head (A/B/A Layer) HDPE/LDPE/LLDPE plastic inflation machine, coded KMTL-4545T, to meet customers' growing demand for greater efficiency, diverse functionality and high productivity. Built with twin die heads and two 3-horsepower cooling blowers, the equipment churns out two 10-32 kilogram rolls of film per hour, with the winder driven by DC motors of 1/2 horsepower to drive rollers 760mm in width, and the take-up unit using AC motors to achieve take-up speed of 85 meters per minute. The extruder unit is developed with an AC 20HP motors coupled with an inverter and two high-quality, improved screws with diameter of 45mm, and features heating capacity of 18.8kw and four barrel cooling fans, therefore enhancing energy efficiency and overall performance. With an improved electro-control system, this machine is also highly stable and safe, being suitable for making films of HDPE, LDPE and LLDPE of thickness and width of 0.01-0.15mm and up to 400mm, respectively. Kang Chyau launches the twin head (A/B/A Layer) HDPE/LDPE/LLDPE plastic inflation machine. To meet increasingly strong market demand for automation, Multiplas Enginery Co., Ltd. demonstrated its two-color screwdriver production line installed with the Fully Automatic Production Cell. The unit integrates two vertical injection molding machines with rotary table and slide table each, and a horizontal injection molding machine with hydraulic clamps to realize fully automatic production line for screwdrivers with dual-toned handles and packaged into blow molded boxes. Multiplas also promoted its vertical plastic injection molding machines, with lots of features to ensure end-users better return on investment, including the up and down clamping mechanism to allow easy insertion, enhance safety and help reduce damage caused to tools; optional molds that meet different requirements to greatly improve productivity, quality control and efficiency; the vertical structure and flexible arrangement of wires and pipes to enable easy assembly, disassembly and maintenance; and highly compact size for smaller footprint and enhanced portability. 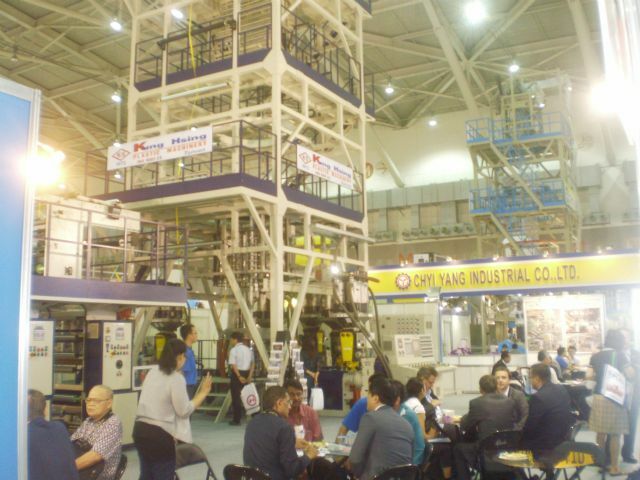 Taipei Plas 2014, like most global trade shows, also staged informative events to enable participants to be updated on the latest industrial developments and allow innovative technologies to be given deserved praise. The Awards 2014 for Excellence in Research and Innovation honored scores of suppliers in five different categories: Plastic Injection Molding Machine, Plastic Extrusion Machine, Plastic Blow Molding Machine, Other Plastic Machine and Rubber Machine, with first prize winners, respectively, being Chuang Lih Fa Machinery Works Co., Ltd. (CLF-180TXR-ECO-μ Microcellular Foam Co-injection Molding Machine), Jenn Chon (JC-3CX-1700RC High Performance Multi-layer CO-extrusion Blown Film Machine), Fong Kee International Machinery Co., Ltd. (FK/HBB75GVT30SS Single Head Single Station-Bottom Blow Molding Machine), Sun Lung Gear Works Co., Ltd. (SLYZB-65 High-efficiency Gearbox for Counter-rotating Conical Twin Screw Extruders), and Tung Yu Hydraulic Machinery Co., Ltd. (TYC0150-2RT-PCD-UP All Electric Rubber Compression Molding Machine). The special awards, Excellent Price and Industrial Design Award, were both given to Fu Chun Shin Machinery Manufacture Co., Ltd., the flagship company of FCS Group, for its HB350 High-powered Horizontal Rotary Tabled Two-Component Injection Molding Machine and HE-150 High Efficiency Electric Hybrid Injection Molding Machine. Tru-Brite’s AH-6S Six-shaft Automatic Aluminum Foil/Cling Film Rewinder is a nominee for Awards 2014 for Excellence in Research and Innovation. 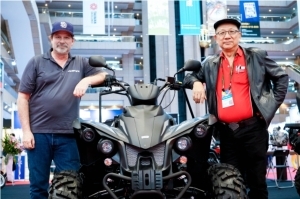 Suppliers who did not win prizes also caught foreign buyers' attention mainly due to impressive performance of mechanical designs. Tru-Brite Machinery Co., Ltd., a specialist of aluminum foil and cling film rewinders, showcased the AH-6S Six-shaft Automatic Aluminum Foil/Cling Film Rewinder coupled with Automatic Shrinking Film Packaging Machine to turn out 20 rolls of 10-meter aluminum foil and PE or PVC film a minute, and glue or tape the rolls without turning off, with the tolerance for foil and film length minimized to only +/- 10mm, to effectively enhance productivity to ensure customers considerable savings and profits. A full slate of seminars and expert conferences remained the tradition of Taipei Plas. The topics of the seminars and lectures included “Trends and Development of International Product Safety Certification for Machinery,” given by Vincent Wang, vice general manager of TUV Rheinland Taiwan Ltd.; “Failure Analysis and Troubleshooting of Plastic Product,” by M.K. Chen, head of Test & Technology Department in Taiwan's Plastic Industry Development Center; “The New Automation Trends in the Plastic Industries,” by Norbert Scholz, managing director of sales and technology in Germany-based Baumuller Nurnberg GmbH; “Welcoming the New Era with 3D Printing,” by Dr. Y.L. Cheng from Department of Mechanical Engineering of National Taiwan University of Science and Technology; “Advanced Technology of Calcium Carbonate Particles for Plastics,'by Dr. Kenichiro Eguchi, researcher of Japan's Shiraishi Central Laboratories Co., Ltd., and many others. To help participants facilitate product sourcing, the organizers arranged 1-on-1 procurement meetings for foreign buyers looking for high-quality injection molding machines, vacuum forming machines, extrusion molding, stretch machines, recycling equipment, bag making machines and other machines made in Taiwan. As an established, well-known export media in Taiwan, CENS held a booth numbered M1306 to provide useful buyer guides, including Taiwan Machinery and Taiwan Plastic & Rubber, Package and Printing Machinery Special, and real-time business matchmaking services to buyers. CENS guides contain information on Taiwanese suppliers of nearly all kinds of machinery to be sought-after by buyers. 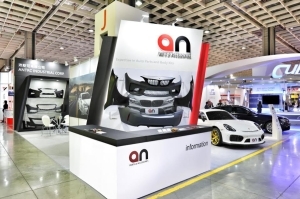 CENS circulates useful buyer guides at the show.